Package include:6 pcs tissue paper flowers party tissue pom poms:2 pcs baby pink(1 12inch+1*10inch)+2 pcs cream(1*12inch+1*10inch)+2 pcs Gold Tissue Paper Pom Poms 12inch+1*10inch); 1 pack of pink cream gold mixed color paper tassel with one white ribbon and using instruction,totally 12 sheets,each color comes with 4 pcs. 2pcs pink litter gold cream mixed color of polka dot garland. Paper Garland Length: approximately 6.5 feet. It’s pre-folded and pre-cut, all you need is fluffing them. These fluffy pom-poms can be a magnificent décor addition for events like birthdays, baby showers, and even bridal showers. Tissue pom-poms can also add the final touch to an outdoor space or nursery. Pure and clean pink cream gold series paper decorations . Perfect for baby shower wedding,bridal shower,birthday party,nersury decoration,rustic wedding etc. Quantity: Package include:Package include:6 pcs tissue paper flowers party tissue pom poms:2 pcs pink(1 *12inch+1*10inch)+2 pcs cream(1*12inch+1*10inch)+2 pcs Gold Polka Dot Tissue Paper Pom Poms(1*12inch+1*10inch); 1 pack of pink cream gold mixed color paper tassel with one white ribbon and using instruction,totally 12 sheets,each color comes with 4 pcs. 2pcs pink litter gold cream mixed color of polka dot garland. Paper Garland Length: approximately 6.5 feet.. 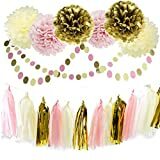 This entry was posted in Wedding Store and tagged 20pcs, Baby, Birthday, Bridal, Circle, Cream, Decoration, Flower, Furuix, Garland, Gold, Paper, Party, pink, Shower, Tassel, Tissue, Wedding by Formal Affair. Bookmark the permalink.